Fall Is Here…Time for an Outdoor Makeover!!! Unless you live in a warmer climate, be sure to choose hardy species that can withstand the cooler temperatures. 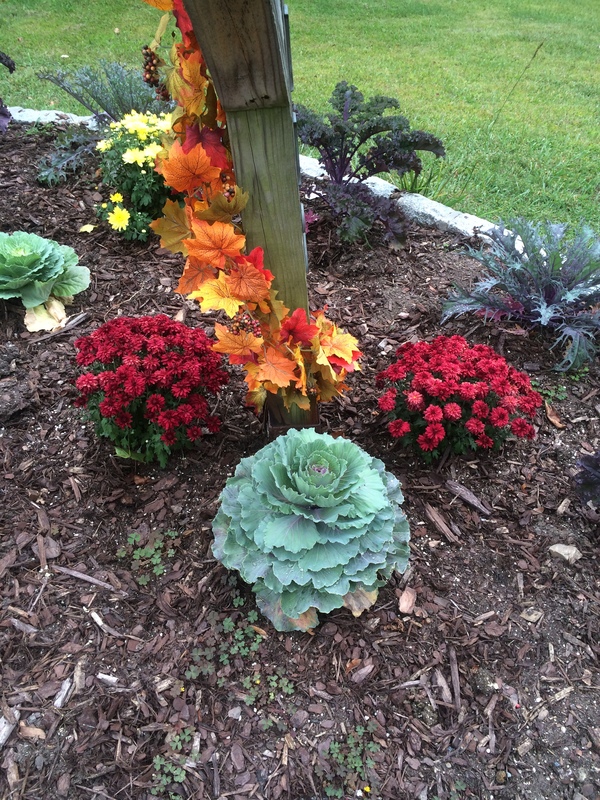 Great choices include: mums, decorative cabbages and ornamental kale. Plant early enough to extend your fall plantings “shelf life”. I find that it is generally best to do my fall planting by no later than mid-September…the weather is still mild enough, in much of the northeast, so that your plants can survive for a longer period of time. 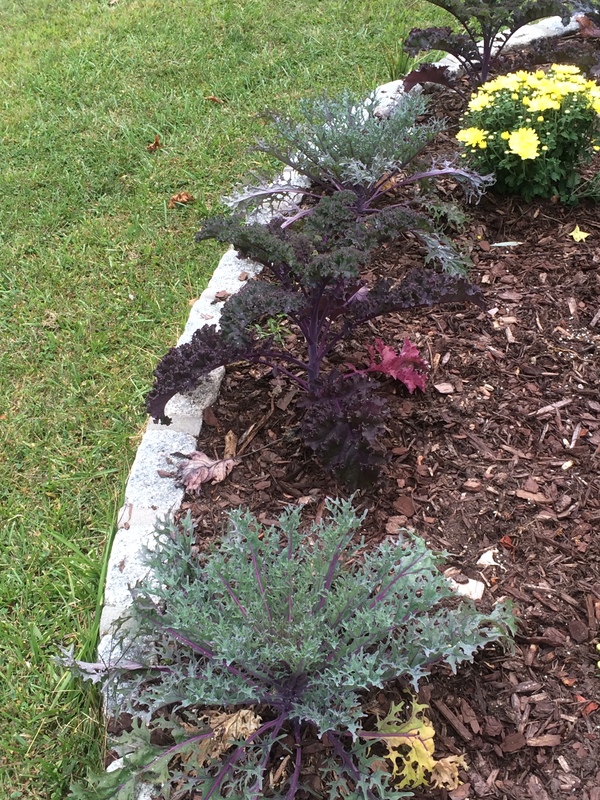 Plant heavily with your kale and cabbage. In my experience, I have found that my kale and cabbage plants generally last into December, while my mums are typically dead by late October to early November. 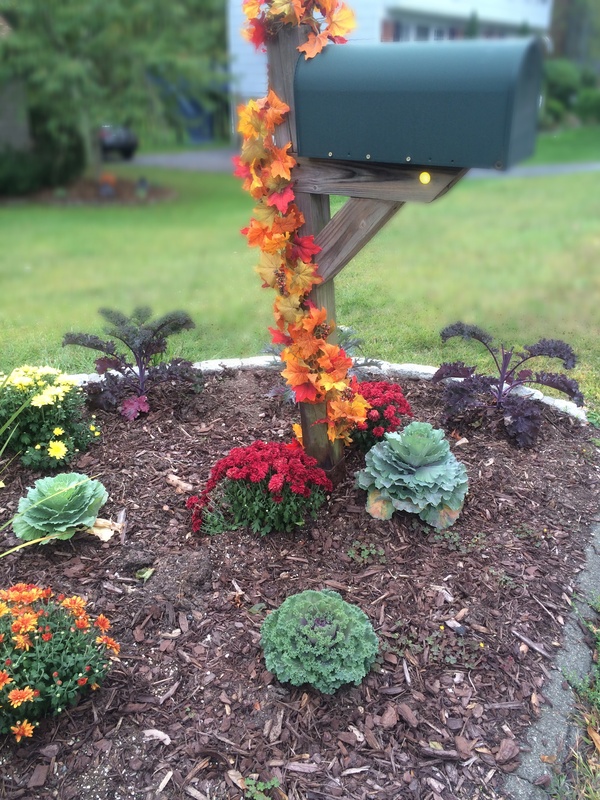 For many years I would opt for colorful mums interspersed with the less colorful kale and cabbages. The issue? After the mums had died, my garden would appear barren. Now I tend to plant very heavily with the non-flowering plants and I just tuck in a mum here and there for a “pop” of color. Go for textures. You will notice that I have chosen different varieties of plants in order to maximize the visual interest of my garden. I have incorporated plants of different heights, colors and textures to draw the eye. I try to lay them out in such a way that makes sense to the eye (for example, using two alternating varieties to form a garden border…see below). Accessorize for a little pop! Use pumpkins, indian corn and faux leaf garlands (you will see below that I have wrapped one of these around my mailbox post) to add a little color. Have fun!!! After all, that is the entire point! Put up a scarecrow, a hay bale or a harvest sign (all of these can be purchased for a very reasonable sum at your local craft store).